Restore shine to granite kitchen and bath countertops. Here’s how. You may be able to restore the shine to dull granite countertops by removing the layer of soap film that builds up. If you have consistently cleaned your stone tops with dishwashing soap, you need to remove granite soap film. Cleaning granite countertops with dish soap is not the best way to clean granite tops though. Do not clean your granite, limestone countertops, or marble daily with dish soap, or you’re bound to get dull granite counters, dull granite edges, and dull granite around the sink. Your countertops lose their shine . . . as well as their natural beauty. Your best bet to restore shine to granite is to remove soap film with a commercially available, professional quality product made specifically for the purpose … and made specifically for use on natural stone surfaces! Avoid homemade concoctions and other cleaners that may have a harmful effect on your granite, marble or limestone. I’ve had great success restoring dull granite countertops with two products. First recommendation is MB-3 Soap Film and Mineral Deposit Remover. MB-3 removes not only soap film but also soap scum and hard water deposits on marble, limestone, granite, and other natural stone countertops. It also works well on quartz countertops as well. You can use it in other areas as well, especially the bathroom. MB-3 is especially effective at removing build-up on stone shower walls and floors. It can also remove those tough hard water deposits on glass shower doors. It’s a non-acid cleaner that quickly dissolves and then removes soap film. It achieves effortlessly what ordinary household cleaners or abrasives can’t achieve even with hard scrubbing. 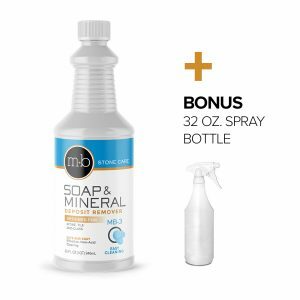 You can also get MB-3 Soap Film Remover as a component of a granite care kit, which includes combinations of granite sealer, soap film remover, and granite daily cleaner. Save money with granite countertop care kits. Restore granite shine with MB-3. Second recommendation is DuPont Soap Scum Remover For Natural Stone. Removes soap scum, hard water deposits, and dirt without scratching granite counters. Soap Scum Remover won’t harm or degrade natural stone counters, floors, or walls nor will it affect the sealer. You can use it on sealed natural stone, ceramic and glass surfaces. DuPont Soap Scum Remover is a 24 oz. Bottle compared to 32 oz. with MB-3. However, Soap Scum Remover is a little easier to use since you apply with a trigger sprayer rather than dilute the product in water, as with MB-3. MB-3 offers much more cleaning product overall. Are your granite countertops properly sealed?